Here's a free printable blessing prayer for a child on the occasion of making their First Holy Communion. Print it or resize it for a number of different uses, such as: gluing it on a gift bag containing a First Communion Gift, laminating it and use it as a bookmark, or placing it in a frame as a table decoration for a First Communion party. 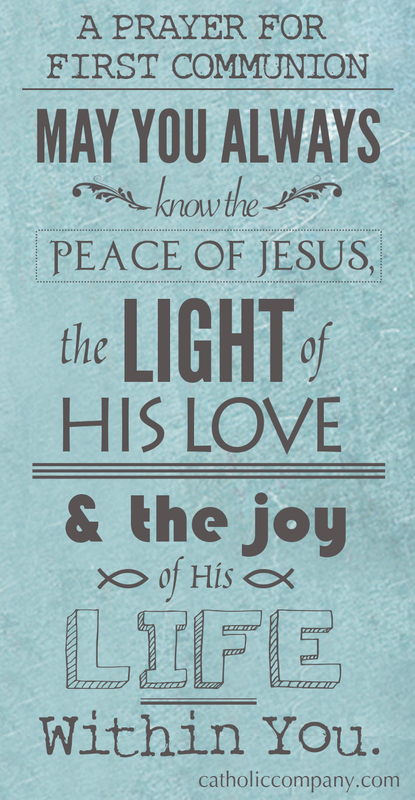 "May you always know the peace of Jesus, the light of His love, and the joy of His life within you." Right click to save the image, or click here for the First Communion Prayer Printable PDF. Hi Julian, you can email this article to yourself (and anyone you wish!) using the envelope icon on this post, you can also download the printable to your desktop by clicking the link in this post. can u send me a copy? thanks. Hi Leesher, on this blog post you will find an icon that has an envelope on it, so that you can email it to yourself or anyone else that you wish. God Bless! Hi Tasia, you can either click the link to the PDF and print, or right click the image and save. How do I print on one page? I always get two pages! Hi Emma, we added a PDF to this post. You can also right click the image to save it on your computer and use how you wish. God Bless! I love the prayer,I will use for my first c communion students.